On Sunday the long-awaited groundbreaking in Batumi finally took place. Expected back in 2015 to happen already in 2016, the ceremony gathered impressive crowds of enthusiastic residents, who witnessed speaches of various officials, including chairman of the Adjarian government Zurab Patardze. The crowd also enjoyed a great performance of khorumi, the traditional war dance which inspired this stadium's design. However interesting the cornerstone mounting ceremony seemed, actual work on the site has been ongoing since late December, because the contract with Anagi Construction Company was signed in mid-December. Now that the site is cleared, construction can indeed poceed. Vast majority of the stadium will be created as a monolithic concrete structure, from foundations to the upper tier of seating. 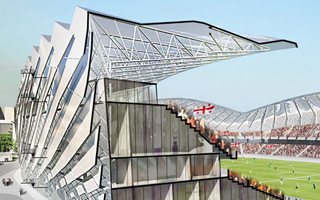 Lower tier, however, will be almost entirely prefabricated, according to information released by Anagi. 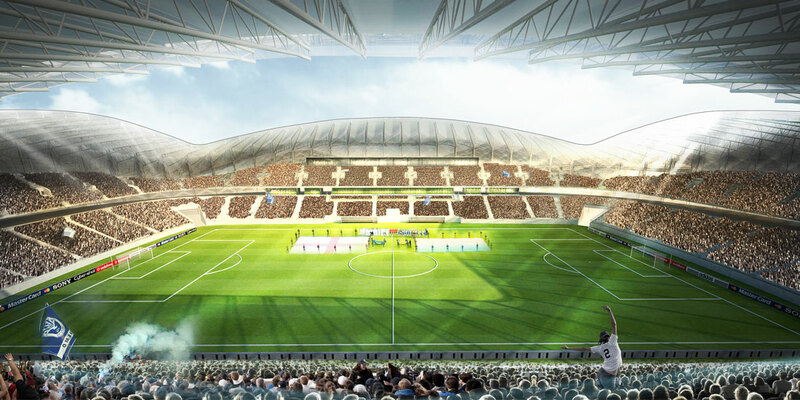 The company has 33 months remaining from its 34-month contract, which means delivery of the stadium should happen by the end of October, 2020. Complete price tag for the stadium and adjacent 1,000 parking spaces is expected to stay just under 100 million lari ($39 million). This seems to be a fair price for a 20,000-seat Category 4 stadium with dynamic and rhythmic design. Covered with membrane strips both on the roof and facades, the building will come alive at night, while providing a very elegant exterior by day.